This controversial subject is really much easier to clear up than one might think. For the Scriptures to be understood properly they must not only be read in their proper context, but they must also be taken at face value. Rendering their plain meaning rather than looking for some hidden truth will go a long way toward understanding the least of the spiritual gifts, speaking in tongues. There are many reasons for the controversies surrounding this gift. More often than not, the gift of speaking in tongues is practiced improperly in many churches today. Some people will even go so far as to say that the primary evidence that a person has received the gift of the Holy Spirit is speaking in tongues. We know that the Holy Spirit bestows gifts to all believers in Jesus Christ, but the Scriptures say that not all believers will receive the same gifts (1 Corinthians 12:30). The Holy Spirit bestows gifts as He determines. One problem in many churches today is that what is often passed off as speaking in tongues is really nothing more than unintelligible babble. 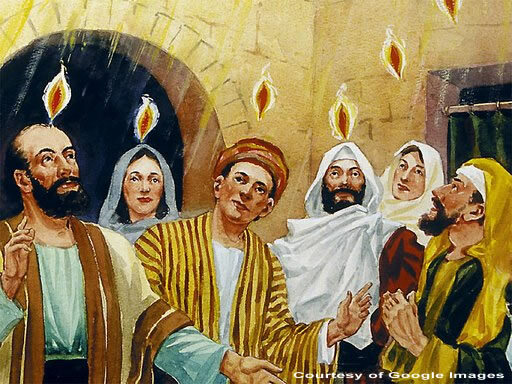 The act of speaking in tongues was first displayed on the day of Pentecost and was actually foreign languages that were spoken by the apostles. These foreign languages were actual languages that were in existence at that time. On that day, there was no need for an interpreter because as you will see, this miraculous gift was given so that every person could hear the message of the gospel in their own language. Reading these Scriptures in their proper context, we see that the apostles spoke, and the people heard foreign languages, languages that were known by those that were present. And we also see the reason that the Holy Spirit gave them this gift; "…we hear them declaring the wonders of God…". Without the ability to speak in foreign languages, foreigners would not have heard the message and so become saved. But what we often hear in churches today is not foreign languages, but something totally different. Practitioners of speaking in tongues in public settings such as church don’t understand what it is they are doing. While they think they are praying to God (and they may very well be), others around them that are unfamiliar with the practice think they are crazy (1 Corinthians 14:23). If there is a reason for a person to speak in tongues (a foreign language) in a public place, the Holy Spirit will enable someone to speak, but He will also enable someone to interpret what was spoken so that everyone can understand. The Bible tells us why someone might speak in tongues before a group. "…a hymn, or a word of instruction, a revelation, a tongue [a foreign language for the sake of a foreigner] or an interpretation. All of these must be done for the strengthening of the church." 1 Corinthians 14:26 NIV. The Bible is also clear that if there is no one to interpret, then the speaker must remain silent. I have been in many church services where so-called speaking in tongues occurred. Even in the pulpit, speaking in tongues was often practiced. But not once did I ever hear a single interpretation. If speaking in tongues, was permitted by the Holy Spirit, there would have been a reason for allowing it, there would have been an interpretation of the message, and it would have been done in an orderly way. Only two, or three people at the most would have been given the gift since the Holy Spirit is a Spirit of order (1 Corinthians 14:27,40). The Greek word for tongue, dialektos as it is used in Acts 2:6 and Acts 2:8 is also interchangeable with the word, language. The Greek word for tongue, glossa as it is used in 1 Corinthians 14:40 is the same word that is used in Acts 2:4, 11. Each of these words literally translated, in no way infers that speaking in tongues is anything other than speaking in known foreign languages, and the only Scriptures that lend the remotest possibility of speaking a language that is only known to God and angels, is 1 Corinthians 13:1, 14:1-2, and 14:27-28, which will be discussed later. There might be confusion between Scriptures of different Bible translations. One problem I found in comparing translations was with the word unknown. There are several references to speaking in tongues where the word unknown is missing from the NIV, but is present in the KJV. This confusion can be cleared up when you realize that the King James translators italicized certain words to indicate that their usage was their "addition" to the text reading and translation. Italicized words in the King James Version are words that do not exist in the original text. Therefore, the context that these words are used in means everything (See http://www.biblebelievers.com/jmelton/italics.html for further explanation). Note: The online KJV at Biblegateway.com does not show the word unknown in italics, but all written versions do. Here we see that the King James translators added the word, unknown to the text, leading some people to believe that this was a tongue or language that is only known to God and angels. It would be a mistake to make this assumption since the Greek word for tongue (glossa or dialektos) literally translates into the language or dialect used by a particular people distinct from that of other nations, or the tongue or language peculiar to any people. Carefully reading the account of what took place at Pentecost, one can easily see that foreign languages that may have been unknown to each other were spoken, and all of those languages were understood by those that were familiar with them. But confusion persists as people practice what they believe is speaking in tongues. And they do not practice their so-called gift according to the Scriptures. Hundreds of people in one church service would not be moved by the Holy Spirit to speak in tongues if the Scriptures say that only two or three at the most should do it, and then there must be an interpretation. Goodman concludes that "when all features of glossolalia [speaking in tongues] were taken into consideration--that is, the segmental structure (such as sounds, syllables, phrases) and its suprasegmental elements (namely, rhythm, accent, and especially overall intonation)-- she concluded that there is no distinction in glossolalia between Christians and the followers of non-Christian (pagan) religions. The "association between trance and glossolalia is now accepted by many researchers as a correct assumption," writes Goodman in the prestigious Encyclopedia of Religion (1987). I have found no evidence in the Bible to support the claim that the Holy Spirit does not today give the gift of speaking in tongues. On the contrary, the apostle Paul alludes to the fact that this gift still exists today, and that we should not forbid the practice. However, it must be done, "…in a fitting and orderly way." The practice of speaking in tongues in many churches today is far from fitting and orderly. First, fitting would suggest that there is a reason and a purpose for such an activity, mainly, to bring instructions to the people, from God "…a hymn, or a word of instruction, a revelation, a tongue or an interpretation”, including people who are foreigners that cannot understand unless you speak in their language (or maybe you’re the foreigner such as a missionary in a foreign country). And second, orderly suggests, and the Bible makes this point clear, that no more than three people should speak in this manner, and there must be an interpreter so that although the foreigner might understand the speaker, the rest of the congregation must also be made aware of what is being said. Speaking in tongues in this context, means speaking in a known foreign language, just as on the day of Pentecost. On the day of Pentecost, there is no reference to speaking in a language that is only known to God and angels. The Bible says that when you speak in tongues, you edify yourself, not the church (1 Corinthians 14:4-5). The apostle Paul would rather you edify the church. Edifying the church is only possible when someone speaks in tongues, and only when there is someone who can rightly interpret what is spoken (1 Corinthians 14:12). As we saw earlier, edifying the church involves "…a hymn, or a word of instruction, a revelation, a tongue or an interpretation. All of these must be done for the strengthening of the church." 1 Corinthians 14:26. There are some Scriptures that suggest to me that there is perhaps a language that can be spoken that only God and angels can understand. I don’t have a problem with this possibility, but I do have a problem with the liberties that have been taken with it. Speaking in tongues (known foreign languages) in a group setting such as in church is for the purpose of bringing instructions to the people that are listening. If there is another tongue (language) that only God and angels can understand, then speaking this language should only be done in private. 1 Corinthians 14:1-2, and 27-28 gives me reason to believe that speaking in tongues (a language that only God and angels can understand) might be possible, even today. If it is true that speaking a language that only God and angels can understand is possible, it has nothing to do with instructions for the church or even edifying the church. If this is a legitimate form of communicating to God, it must be done in private so that unbelievers don’t think you’re crazy, and because 1 Corinthians 14:1-2 says that no one but God will understand you. In this case, an interpretation is not even possible since only God understands you. If an interpretation is not possible, the speaker must remain silent. The apostle Paul was firm about people speaking intelligible words so that everyone would understand what was being said. When referring to what a person sounds like while speaking in tongues, The NIV uses the word foreigner in 1 Corinthians 14:11, but the KJV uses the more accurate word, barbarian. 3) used by the Greeks of any foreigner ignorant of the Greek language, whether mental or moral, with the added notion after the Persian war, of rudeness and brutality. The word is used in the N.T. without the idea of reproachfulness. In this context, the apostle Paul is telling us that speaking in a foreign language that is not understood by anyone makes a person sound like a barbarian. Speaking in a tongue (foreign language) has a purpose, and that purpose is to edify the Church by giving "…a hymn, or a word of instruction, a revelation, a tongue or an interpretation”. Speaking in tongues was also given as a sign for unbelievers. The sign that the apostle Paul is speaking about is not unintelligible babbling, but that the unbeliever can hear and understand what is being said in his own language, which is being spoken by a foreigner. This was the sign at Pentecost. Unbelievers became believers because of the miracle that took place. Uneducated Galileans were speaking to them in languages that they could understand. Unbelievers that hear what they consider unintelligible babbling, will think the Church has lost its mind. The apostle Paul wants to make sure that we don’t scare off unbelievers. This is why he would rather that we all prophesy. He wanted unbelievers to become believers by hearing the message. If they hear babble, where is the message? In other words, if the unbeliever hears the true message, he becomes convinced and repents, falling down on his face to worship God, and that the God that resides in you is the true God. This is not possible when tongues (a language that only God and angels can understand) is spoken around unbelievers. And since only God and angels can understand this language (and no interpretation is possible), speaking in tongues (a language that only God and angels can understand) must be done in silence. On the day of Pentecost (Acts 2:1-4) the people heard the message in their own tongue [language], because God wanted them to hear the Gospel (Acts 2:5-36). The apostles spoke in tongues [other languages] to the people that were present, and not to God, and the people heard the message in their own language. Acts 2:37-39 explains why it was important to speak in foreign languages. On the day of Pentecost, After hearing the message in their own language, recognizing the miracle that had come from God, they were cut to the heart and wanted to know what they must do. So the apostles instructed them on how to be saved. The people heard the message, they believed it, and those who repented and were baptized, received the gift of the Holy Spirit. These instructions were not only for them, but they were for all whom God will call in the future. If there is a language barrier in leading the world to Christ, God will make a way for that barrier to be broken. He sent His people out to preach the Gospel to the world; to make disciples, and to baptize in the name of the Father, the Son, and the Holy Spirit. He gave the command, therefore He will equip those that He sends, with the means to communicate His message, even if that means allowing the messenger the ability to speak in a foreign language, just like He did at Pentecost. Why do you suppose God would give some believers the gift to speak with new tongues? So that they too might carry on His mission to go out into all the world, and preach the gospel. There is one final point to consider. The contemporary phenomenon of "speaking in tongues" is of recent origin in Christianity. 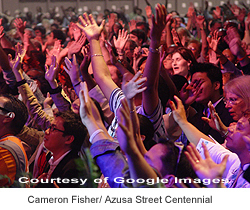 It is part of the Pentecostalism of the twentieth century, beginning in modern times around 1900 and more recently, since the 1960's, involving the charismatic movement. Why had the gift of tongues not been made manifest until around 1900? Were there no true Christians in the world, preventing the Holy Spirit from giving the gift of tongues? And if there were no true Christians in the world, how could others hear and then believe so that they too might receive the gift of the Holy Spirit? Did non-Christians preach the gospel according to the command that Jesus gave His disciples, to go out into all the world and preach the gospel? Certainly, non-Christians do make an attempt to preach the gospel, but it is only for personal gain that they do. Not having the proper understanding, their gospel is that different gospel that the Bible warns us about. How did the Holy Spirit work on the day of Pentecost? The word "gave" denotes a gift of the Holy Spirit. The gift of speaking in tongues is not a learned experience. This is in contrast to the practice in Pentecostalism and among the charismatics with their meetings of groups of people where they are taught how to expand their consciousness and bypass the intellect in order to engage in glossolalia, speaking in tongues. I was once part of a large Pentecostal/Charismatic church. During one of our Sunday evening services, the senior pastor decided to devote the time to the laying on hands for the purpose of administering the baptism of the Holy Spirit for certain members. Such a large church required that there would be many pastors assigned to a certain number of individuals. They were called, Shepherding pastors. After the senior pastor made the announcement, my shepherding pastor came directly to where I was standing. “Bruce”, he said, “would you like to receive the Holy Spirit?” I told him “I already have the Holy Spirit.” He told me that if I really wanted to receive the Holy Spirit, he would lay his hands on me and pray, and I would then be able to speak in tongues. Then he explained to me how to go about speaking in tongues. “Open your mouth” he said, “Stick out your tongue and wiggle it while you try to make a sound. Don’t worry if it sounds strange, it’s supposed to sound strange.” I told him that I would not do as he instructed because “If God wants me to speak in tongues, He will cause me to do it without having to be taught”. He then prayed that the spirit of stubbornness would leave me so that one day I could receive the Holy Spirit, and then he went on to someone else. This was most insulting to me. I had been a Christian for about three years when that event took place. Had my faith been weak, I might have surrendered to the pressure to speak the babble that the pastor was trying to make me speak, or I would have left feeling like I would never be a Christian since I was unable to receive the gift of the Holy Spirit (according to my pastor). I am not convinced that there is a language that only God and angels can understand or even that men can be given the ability to speak it. But I have to say that based on certain Scriptures I can’t count out that possibility. If the possibility exists, it is for speaking directly to God and must be done in private since no interpretation is possible (1 Corinthians 14:1-2). I am convinced that God gave the apostles the gift to speak in known foreign languages, as demonstrated on the day of Pentecost. I can’t rule out the possibility that God gives that gift (to speak in known foreign languages) to people today. There is nothing in the Bible that tells me that God has ceased to give that gift. He can do what He wants to do, when He wants to do it as long as it does not go against His Word or His nature.